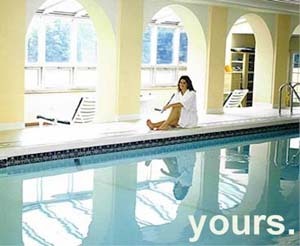 The New Age Health Spa is the only destination spa in New York State. Located on 280 acres in Sullivan County, the all-inclusive resort has launched unique individual spa therapies to enhance its already impressive collection of spa services. Since its inception in 1986, New Age Health Spa has been regarded as an innovator within the spa industry. Not necessarily synonymous with trendy new treatments, New Age Health Spa looks to ancient healing arts and natural elements from around the world when creating its therapies. One of two new signature body treatments, introduced for 2003, is New Age Health Spa`s 100-minute Healing Stone Therapy. It is unique it that it offers much more than the now familiar hot stone massage, this comprehensive treatment incorporates the healing traditions of aromatherapy, chakra balancing and gemstone therapy for a complete mind, body, spirit experience. The second signature body treatment introduced this year is the rejuvenating Maple Sugar Body Polish. The reconditioning treatment for the skin is the result of over 30 years research by a leading Canadian chemist, Ben Kamins. In search of a solution to oxidation and wrinkling of aging skin, Kamins questioned how selected maple trees could survive and thrive for hundreds of years in cold and unforgiving climates. The answer, it is said, can be found in Kamins` vitamin enriched Bio-Maple Sugar? compound. “Our spa treatments play an essential role in the nurturing cocoon that is the New Age Health Spa experience,” says Terry Whipple, Treatment Director. Fitness Facilities - including a fully equipped gym, heated indoor and outdoor swimming pools, and exercise studio hosting innovative cardiovascular, muscle-conditioning and stretch classes each day. The Cayuga Yoga & Meditation Centre is home to the New Age Spiritual programme. Classes in Yoga, Tai Chi, Meditation and Chi Kung, take place daily in this rural sanctuary featuring a field stone fireplace and indoor waterfall. For Outdoor Enthusiasts, New Age Health Spa offers one of the best hiking programmes in the Catskills. On-site activities include the Alpine Tower climb and High Elements challenge course. Additionally, over five miles of groomed trails encompass the spa property accommodating a variety of seasonal activities. The Spa Cuisine meal plan offers healthy low-fat meals. Creative chefs work closely with the nutrition staff to prepare vegetarian-friendly meals using high quality ingredients, many of which are grown in the spa`s own organic greenhouses. A juice fasting programme for guests seeking a more cleansing diet is another dining option. Holistic Spa Treatments take the form of pampering bodywork or private wellness consultations. Muscle soothing massage, skin conditioning body wraps and anti-aging facials rejuvenate the body, while consultations addressing health issues such as weight and stress management help to provide guests with a recipe for a more balanced way of life.